I have always loved soups. No, not canned soups, but the homemade wholesome stuff. It doesn’t have to be cold outside for me to enjoy a warm bowl; I’ll eat soup year-round. For me, one of the most anticipated benefits of fall is winter squash. I’m so excited to cook with pumpkin and butternut squash, two of my favorite winter squash. 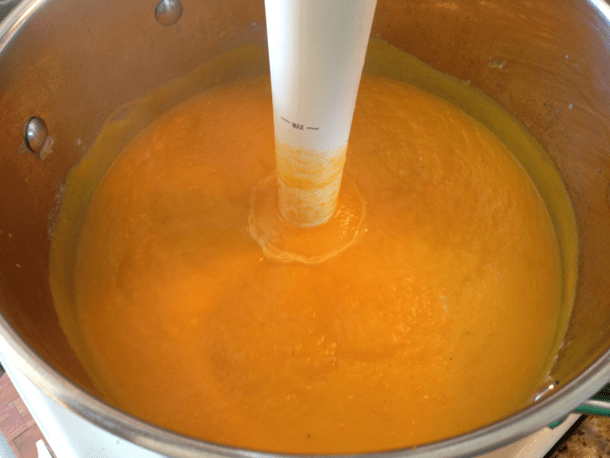 Yesterday, I whipped up a batch of butternut squash soup, complete with carrots and apples as well. It turned out just as my tastebuds imagined. Because this soup is slightly sweet, it’s delicious topped with crumbled bacon. I left a little texture to my soup instead of blending it smooth, but it’s totally a preference thing. 1. Add squash, carrots, apples, onion, garlic and oil to dutch oven or large sauce pan with lid. Cover and cook on medium-high heat for 20 minutes. 2. Add in broth, coconut milk, cider and spices, and reduce heat to low and simmer (covered) for 30 minutes. 3. Use immersion blender to achieve desired texture. Sprinkle your soup with toppings such as crumbled bacon, avocado, shaved parmesan, toasted pumpkin seeds, fresh herbs, etc. It’s really that simple. All the time is involved in the prep work of peeling and dicing. 1. 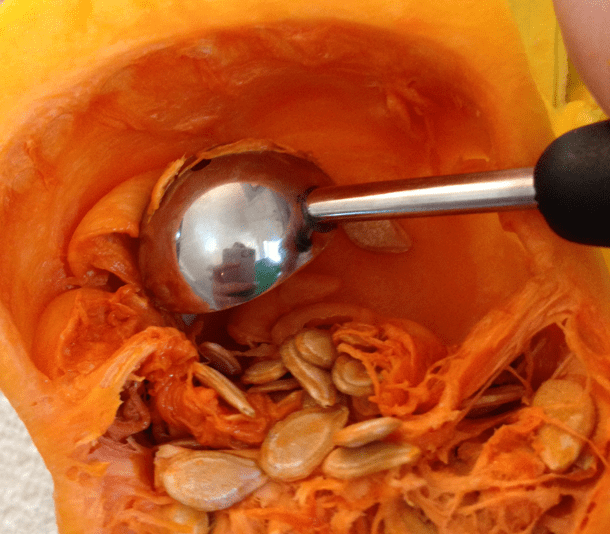 Melon scraper: For a few years, I had been using spoons and knives to try to scrape out the middle of butternut, acorn and spaghetti squashes. Then I bought a melon scraper and my life has been forever changed. It makes things so quick and easy. You must get one if you cook winter squash often. 2. 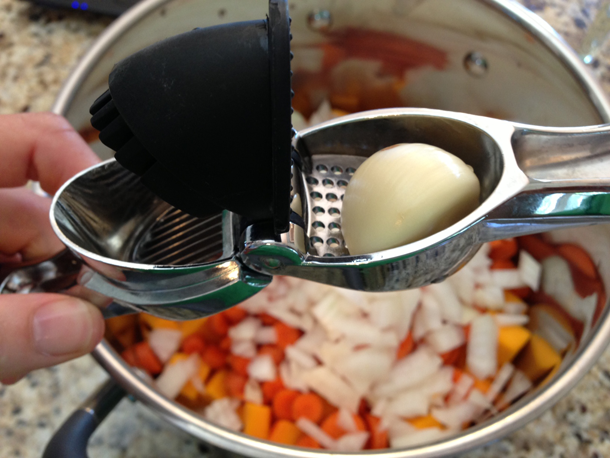 Garlic press: Because I do not enjoy mincing garlic by hand (the smell never fades! ), I had resigned myself to buying jars of minced garlic. But in our move this summer, I came across a garlic press in the back of one of our drawers that I didn’t even realize we had, and now I’m in love. Fresh garlic really is better, and now I don’t have to worry about the oils getting on my hands and smelling like garlic for 24 hours. 3. Immersion blender: We’ve had ours for years, and I know there are far fancier ones on the market, but I still can’t imagine they are very expensive. They are a lifesaver when blending soups. I can’t imagine having to transport hot soup to a regular blender in batches. We also use ours for blending eggs for quiche, protein shakes and bulletproof coffee.